This season’s bright and bold makeup is a one of the most 'eye-catching' trends, and Chanel’s brand new collection, L'Eté Papillon de Chanel, is an open invitation to experiment with all the new and shimmering colors that this collection contains. The French luxury brand's Été Papillon de Chanelline is aptly named because it is inspired by "butterfly wings with eyelids in endless combinations" and the intense color palette has been taken straight from nature, with blues, greens and neutrals. The limited edition collection includes waterproof mascaras, eye shadow pencils, a waterproof eyeliner, nail polishes, lipsticks and lip gloss. The Stylo Eyeshadow pencils are divine, as they soft and creamy and can also double as liners. Easy to apply and long lasting, the come in Moon River (platinum) Cool Gold, Pink Lagoon, Jade Shore (green) Blue Ray (silvery turquoise blue) and Black Stream colors, and you can go for a monochromatic look, or use more than oneof the colors to create a more dramatic look. Chanel has increased the intensity of the pigments in their waterproof mascara. 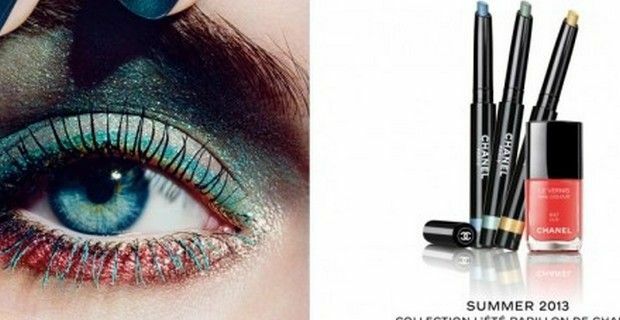 The mascara comes in five captivating shades: blue, green, lime green, bright yellow, electric blue and classic black and you can try the bicolor look on your lashes, and you can add the Stylo Yeux waterproofturquoise-blue eyeliner for even more eye definition. With such bold eyes, you’ll want to keep your lips as natural as possible, but still colored, you can choose either the Rouge Coco Shine lip gloss that is available in two pink tones, Idylle and Pygmalion , or from three shades of lipsticks, raspberry, fresh mandarin and pearly beige, (Zephyr, Evolee and Eden). L’été Papillon De Chanel collection also includes new nail polishes to illuminate your nails: Azure that is shimmering metallic blue-green, Bel-Argus that is blue, and Lilis that is a coral color.